Cotton the most important fibre crop of global significance enjoys a predominant position amongst all cash crops in India. After introduction of BT cotton, it enjoys the position amongst all cash crops in India. After introduction of Bt cotton, it enjoys the position amongst all India, with largest acreage (9.53 million ha) and also rank second in global production (5.65 million mt) contributing to 22% of world's fibre requirement. The importance of cotton in India has given an impetus to develop a strong base of cotton research in IUBTPL, is which is built on a history of scientific approach, hard work, success and commitment to provide cotton farmers their real choice. IUBTPL have developed its own expertise in germplasm, cotton breeding, seed production and transgenic hybrid development. Through its stringent research, breeding and development programmes, the company continue to offer to cotton farmers a wide range of yielding and quality transgenic hybrid that are adaptable across the country. With the legacy of elite germplasm, high yields, maximum quqlity and innovative technology, 10 transgenic cotton hybrid have laid the foundation to become a leading choice among the cotton farmer of India. Growing zones of India. Trial specific research at IUBTPL brings unique and newer genetics to India cotton farmers. IUBTPL have always desired to develop strong relationship with progressive farmers and ginners. They express pride in growing quality cotton hybrid from IUBTPL to bring about impressive yields at farm and lint market levels. Vibha seeds draw upon one of the India's largest pool of diverse germplasm and has developed more thane 2500 proprietary trati specific berrding lines, which are used to develop new trendsin quality trait specific BT hybrids of suoerior yield preformance. 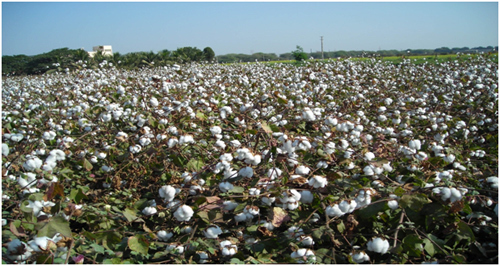 Wied spread testing centers allow rigorous testing of transgenic cotton hybrids for. Agronomic practices for spacing, micronutrient requirement, drip irrigation etc. Newly emerging threats like thrips and mites syndrome, mealy bug &sucking pest complex, photo-period sensitivity etc.